If you are not using some type of treatment system, the water coming from your faucets likely is not as clean and pure as you would like to think. 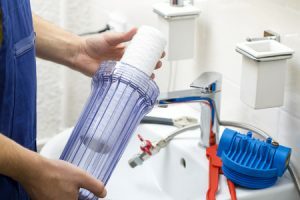 Many residential water supplies contain a variety of contaminants that can damage your home’s plumbing fixtures and even have an impact on your family’s health. At Rowell’s Services, we offer water conditioners as well as filtration and purification systems to ensure that you and your family have access to fresh, clean water for drinking, cooking, bathing and more. Water conditioners are primarily used to treat hard water or water that contains excess dissolved minerals. These minerals build up around your plumbing fixtures, and they can decrease the lifespan of appliances like dishwashers and washing machines. They also build up on your skin and in your hair and can cause dryness. Water softeners and conditioners remove the minerals to eliminate these problems. Municipal water supplies and wells often contain contaminants like chloramine, ammonia, arsenic, lead, mercury, fluoride, bacteria and viruses. Water filtration and purification systems are designed to eliminate these contaminants before the water comes out of your faucet. At Rowell’s Services, we sell and install a variety of water treatment systems to ensure that you and your family are not exposed to harmful contaminants. When you contact us, we will conduct on-site water testing to determine exactly what contaminants are lurking in your water. This lets us know what type of treatment system would be best suited to your home. We will recommend the best possible options and install the system at a time that is convenient for you. We also offer maintenance and repair services to make sure your water treatment system does its job flawlessly. If you are concerned about what’s lurking in your water, contact us today to schedule a water test and to learn more about our water conditioners and water filtration and purification systems. Call 603-934-4145.